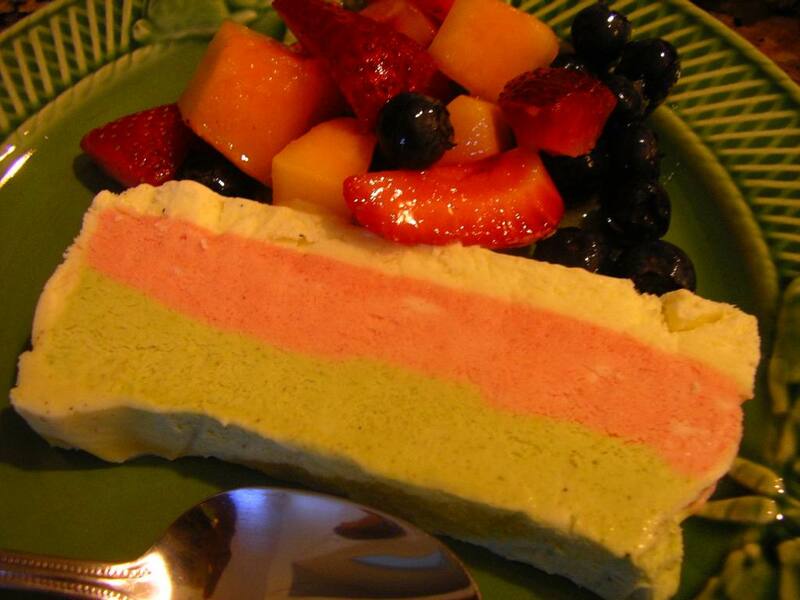 I can’t take credit for this luscious layered semifreddo. I can definitely vouch for its sinful deliciousness, though. And it was so very, very good that I just might decide to make it myself, despite the fact that this is definitely not a spur of the moment undertaking. I can picture one day in the dog days of August when it’s so stifling hot that I’ll dream up any excuse to stay inside the air conditioning and take several hours to make this delightfully refreshing frozen concoction. This semifreddo is featured on the cover of June’s Bon Appetit and its pastel prettiness captured Lynn’s fancy on sight. I’m happy for the rest of us that the recipe’s detail did not scare her off. Actually, it’s not that hard, really, just time consuming and one of those recipes that requires you dirty half your bowls and utensils.I loved the fact that the recipe uses the real vanilla bean. And ground pistachios and fresh strawberries. But combine pistachios and vanilla and strawberries, with cream and eggs and sugar, I’m one easy mark for near gluttony. Although I really don’t have a great sweet tooth, I’m a sucker for any kind of ice cream. But my all-time favorite is pistachio. As a child, our family traveled three hours each way once a month to Grandma’s and a pit stop at a Howard Johnson’s on the way meant coffee for the driver and ice cream for the kids. And pistachio was my perennial request. So if you ever want to spend a day in a cool house, make this. Trust me; you’ll be rewarded with kudos like you would not believe. Line a metal loaf pan (approximately 9x5x3”) with two layers of plastic wrap, leaving generous overhang on all sides. Grind pistachios and 2 T sugar in a food processor until very finely chopped. Transfer pistachio mixture to a small saucepan. Add ½ C milk; bring to a boil. Remove from heat, cover and let steep 20 minutes. Set a fine mesh strainer over a medium bowl; strain, discarding solids. Stir in almond extract; set pistachio mixture aside. Place remaining ½ cup milk in a separate small saucepan. Scrape in seeds from vanilla bean; add bean and bring to a simmer. Remove from heat, cover, and let steep for 15 minutes. Set a strainer over another small bowl; strain, discarding solids, and chill vanilla mixture. Whisk eggs, salt and remaining ½ cup sugar in a medium metal bowl. Set bowl over a medium saucepan of simmering water (do not allow bottom of bowl to touch water). Beat egg mixture at high speed until it triples in volume and an instant-read thermometer inserted into mixture registers 170 degrees Fahrenheit, about 3 minutes. Remove bowl from over water and continue beating until thick and cool, about 3 minutes. Add one-third egg mixture to each of the pistachio, strawberry and vanilla mixtures; fold each just to blend. Beat cream in a large bowl until soft peaks form. 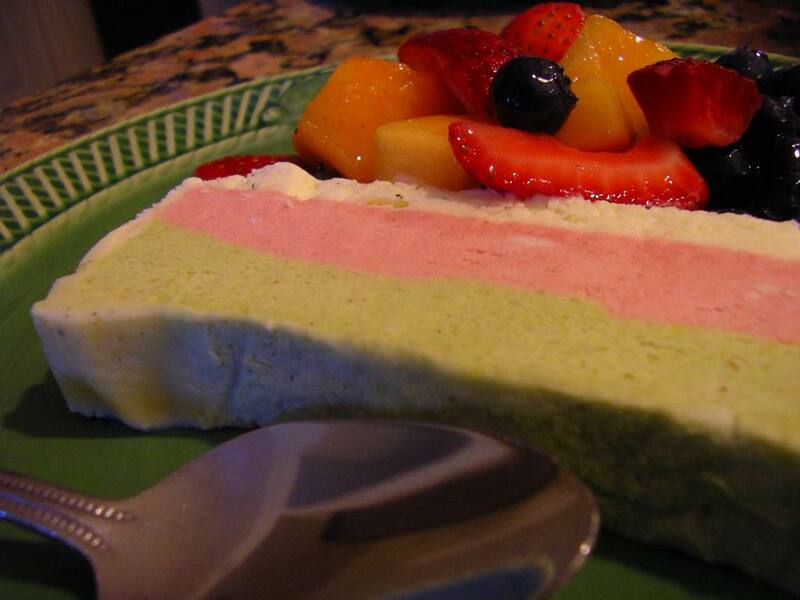 Add one third of cream to each of the pistachio, strawberry and vanilla mixtures; fold each just to blend. Cover vanilla and strawberry mixtures separately; chill. Pour pistachio mixture into pan; smooth top. Cover; freeze until firm, about 45 minutes. Gently pour strawberry mixture over pistachio layer; smooth top. Cover; freeze until firm, about 45 minutes. Gently fold vanilla mixture to blend and pour over and smooth top. Freeze until firm about 4 hours. DO AHEAD: Can be made 3 days ahead. Fold plastic wrap over. Seal tightly and keep frozen. When ready to serve, uncover semifreddo and using plastic wrap as an aid invert onto a chilled platter. Peel off plastic. Slice cross wise. You can freeze any leftovers, but I doubt there would be any. Bon Appetit also suggests that if you want to bypass the layered look, you can choose just one of the flavors and just triple the measurements. That looks so good! It's a quirky little cuto dessert :) Well done! Wow! Not only do the flavors sounds delicious, the colors are so pretty! Who could resist? Two wonderful cooks in the family! What a meal! What a pretty dessert this is. I have never made a semifreido but I'm going to start now, with these delicious flavours. I bet your sister claims that you are the better cook! But she did come up with a beautiful summer dessert...it sounds wonderful! This needs to go in my summer recipe file under "delicious"! Wow, she did a great job. I'm wishing I had a slice on this hot, summer night. Thank you for sharing your creative spirit with me. I love ending my day with your blog. I hope you have a beautiful Tuesday. Much love from Austin! This looks and sounds so delicious and refreshing - I wish I could eat it tonight! I found you from A Perfect Bite , you have a lovely blog and I've signed up to follow you! I came over Krista's blog. Can this look anymore mouthwatering? and it looks so perfect too! I must try it this summer for sure. I saw that magazine and I'm thrilled to read your review of the recipe!! Yep... this will do nicely!! Beautiful! I've just started a search for brunch recipes for a fundraiser I'm having in a few weeks and this is on the menu; although I might have to make a few changes. I'll let you know how it fares! Thanks for sharing!